The Shih Tzu originated in China and actually takes its name from the Chinese word for 'lion dog'. Owners often choose a name that matches up to their dog's origins. Some favorite Chinese dog names include Mei (meaning plum), Bai (meaning white), and Luxian (meaning route). 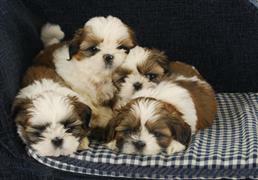 The Shih Tzu has taken the nickname 'Chrysanthemum Dog' that was derived from the appearance of the breed's face. Some name ideas taken from flowering plants include Caspia, Dahlia, and Rose. The Shih Tzu is known for its long silky coat. Satin, Velvet, and Noil are names borrowed from fabrics that are commonly made of silk. Another interesting way to come up with a name for your Shih Tzu pup is to consider popular fragrances. For a male some names derived from favorite colognes are Polo, Hugo, and Klein. Perfume inspired names for a female include Dolce, Grace, and Bella. Some of our pages will contain a subcategory. A subcategory is a slightly more specific grouping than the main topic of the page. For a subcategory, we will include a separated table of names and corresponding descriptions. An example of a subcategory of Red Dog Names would be 'Dog Names Inspired by Red Wines'. If you have any subcategory ideas for the Shih Tzu Names page, we would love to hear them. Use the form below to submit your ideas.